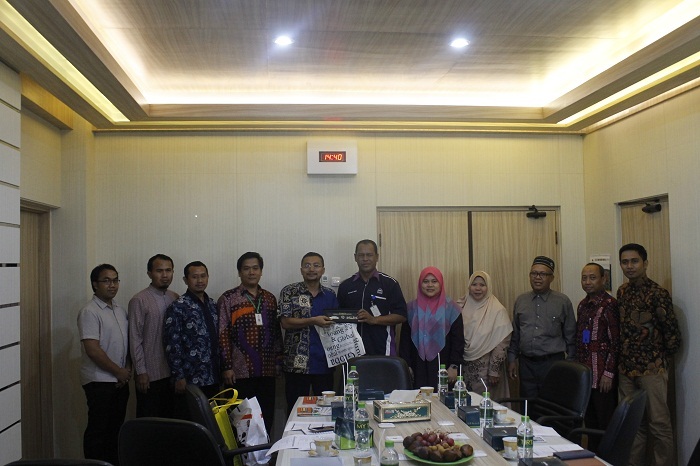 Faculty of Language Education (FLE) University Muhammadiyah Yogyakarta received a delegation from the Universiti Sains Islam Malaysia (USIM) on Tuesday, October 23rd, 2018. During this visit, USIM sent delegation from Main Language Study Faculty (FPBU), Prof. Madya DR. Noor Azizi bin Ismail, Dr. Ramiaida Darmi, Dr. Rosilawati Ramlan and Dr. Badrul Munir Muhammad Nur. Mr. Eko Priyo Purnomo, Ph.D as Director of the Cooperation Institute of UMY welcomed and also star the meeting along with other representatives from Faculty Language Education of UMY Mr. Dedi Suryadi, Ph.D and Nanang Joko Purwanto, M.Pd.I as the Vice Dean I and II FLE. On this agenda, both parties conveyed things that could be done to establish cooperation between USIM and UMY. Among them are the existence of student exchange program plans (Student Exchange), exchange of staff (Exchange Staff), dual degree programs, supervisor programs, journals programs, and joint research programs. In line with this, the delegates also conveyed the rules and conditions that apply to the cooperation program of each university. At the end of this meeting, the delegates from the Main Language Study Faculty with the Faculty of Language Education explained to each other the conditions and programs in each Faculty. It aims to give each other an overview of the academic conditions of each faculty.